Check out City Canvas at the First Friday Art Murmur! Come check us out this Friday—and spread the word! 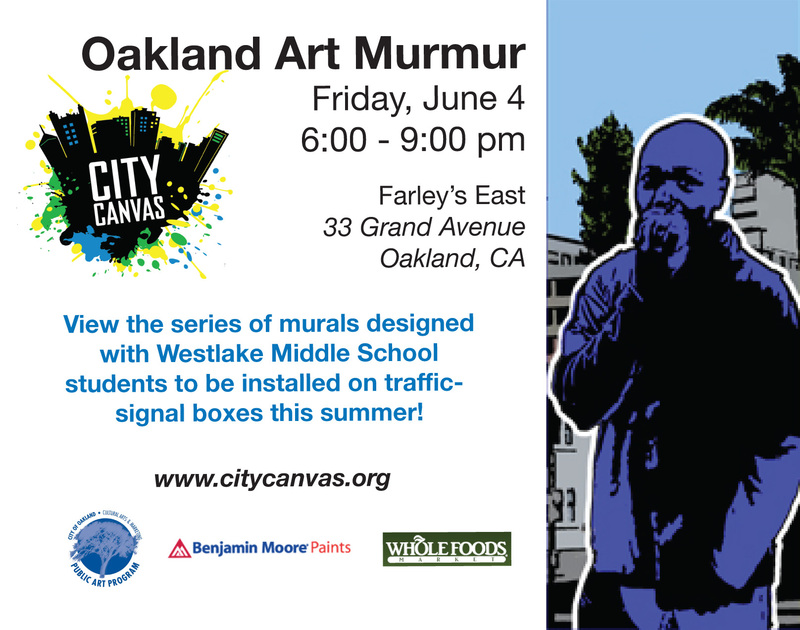 The City Canvas Westlake murals will debut on Friday, June 4 at Farley’s East (Grand and Broadway in Uptown) as part of the June Art Murmur. New murals will cycle through the gallery throughout the month of June as each set is removed to be installed on traffic signal boxes. Look for the murals on signal boxes along Broadway, Grand, and Harrison beginning later this month. For more information on the project, visit www.citycanvas.org. 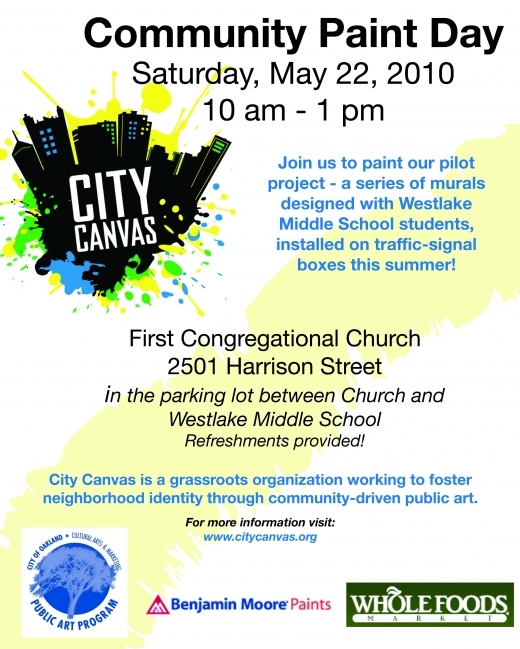 Please come to the first City Canvas Community Paint Day at Westlake! Join City Canvas, a new East Bay arts organization, for painting, food, and drinks in the parking lot between Westlake Middle School and First Congregational Church on Harrison. We’ll be painting murals designed by Oakland artist David Stern-Gottfried in collaboration with eighth-grade students at Westlake Middle School. In June, these murals will be on display for First Friday (location TBD, so stay tuned!) and then installed on traffic signal boxes throughout the Westlake/Uptown area. Thanks to Westlake Middle School, Open Circle, the City of Oakland Public Art Program, Benjamin Moore Paints, and Whole Foods Oakland for their support of this project. 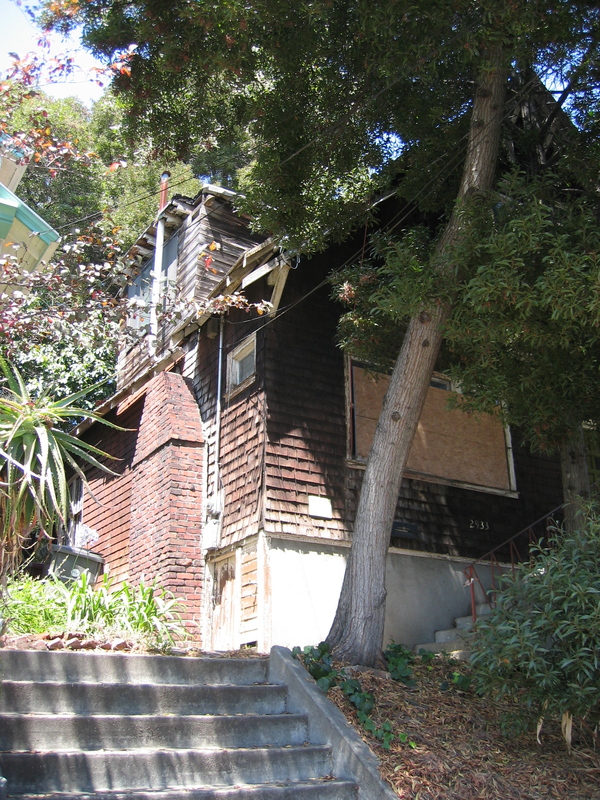 For more information on City Canvas and the Westlake project, check out our website. 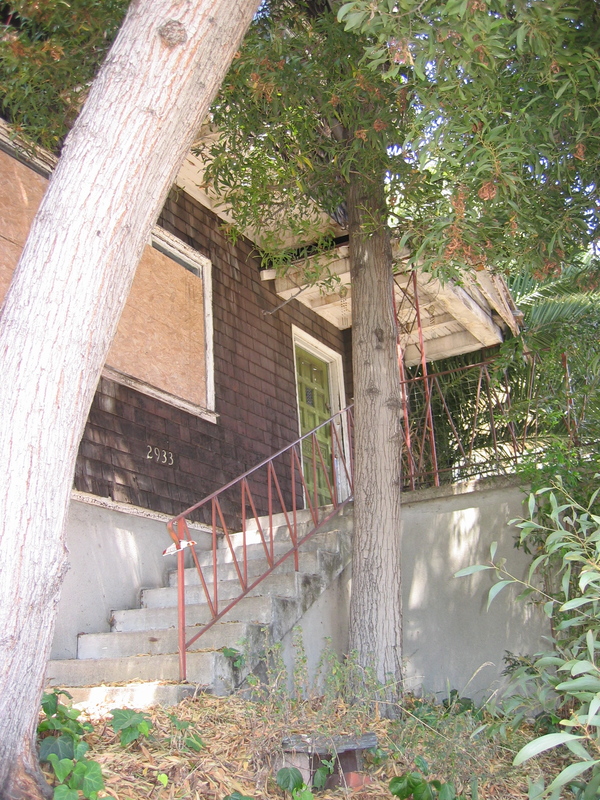 Live in the neighborhood or own a business with a window for flyer-hanging? Click here to download a flyer. If you drive, please try to park on the street as we’ll need the parking lot itself for painting. Last weekend, we had a chance to visit the newly-opened Café Noir (on Auto Row at Webster) at long last. We’ve been watching and waiting for this place to open for as long as we’ve lived in the neighborhood, and had been getting pretty nervous in recent months when the renovations looked done but nothing seemed to be happening. Finally, though, this little café on Auto Row next to Mua opened its doors last month with a limited menu of coffee, pizza, and crêpes. We took our next free weekend morning to go for a walk and try it out. And then there’s the space. The interior is very nicely done (as well it should be, after years of renovation! ), though on this visit we had the Labradane in tow so we opted for an outside table. (There weren’t any set up when we arrived, but the owner, who was very friendly and accommodating in general, was quick to bring one out for us.) The main problem with the space was simply that it was empty. One other couple was having breakfast at the counter when we arrived, and the guy from the bike store down the street swung by for a coffee, but otherwise, it was just one big empty space crying out for people. I have a feeling that if and when this place gets its groove going, the vibe will change completely—it looks like the kind of space that should be buzzing with conversation and motion. I can’t help but think that Café Noir is a little ahead of its time (which is pretty ironic given the three years it took to finally open!) We sat out on the Webster Street plaza that doubles as a parking lot and car showroom, so cars periodically drove right past our table, bumping over the stones and sidewalks. And, of course, that’s exactly what they designed this plaza for, so it’s hard to complain. The Avis Rent-A-Car garage entrance is just two doors down and a dumpster and grease bin sit a few yards away. The funny thing, though, is that it’s not hard to envision this plaza post-Auto Row, when a few planters might carve out a separate patio area, people will sit and look out on Broadway as they drink a morning latte or an afternoon beer, and the only traffic will be the bikes headed to and from the bike shop or people en route to the martial arts/yoga studio that now sits in the middle of the block. For now, though, these are the pioneers. Walking back home, I took note of the many changes in the works on this stretch of Auto Row: Bay Bridge Chrysler, which is slated to close and currently shares space (and another beautiful plaza) with Z Café and Bar; the empty Kia dealer; the parking lot on 27th that’s temporarily housing Audi of Oakland’s stock but has a giant “for lease” sign up (and a really cool abandoned diner at the back of the lot). Just up the street are a mish-mash of businesses: a newish art gallery (which sadly seems to be closed, at least for right now), auto repair shops that have been here for decades, a brand-new children’s gymnastics studio that took the plunge and moved down here from a posher Piedmont Avenue space. 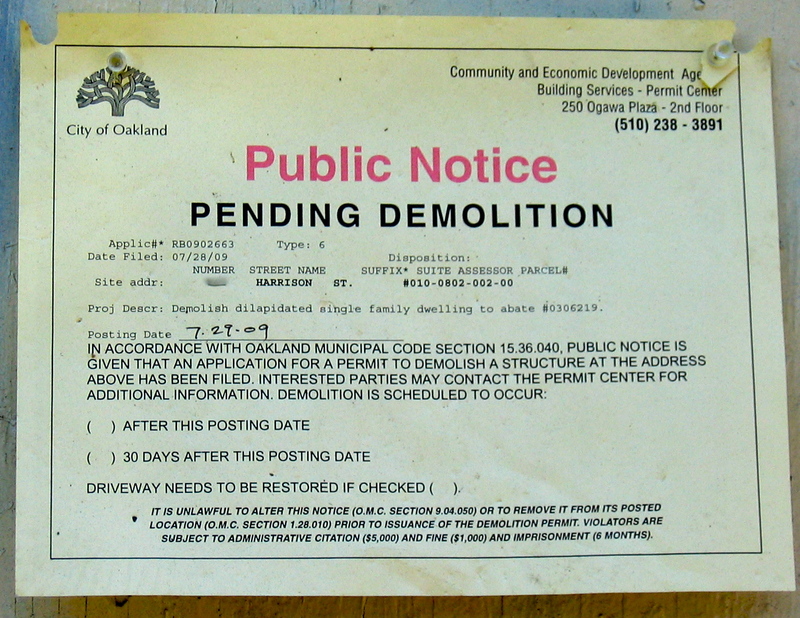 And, of course, dozens of empty storefronts that once housed auto dealers, repair shops, and other related businesses. The whole corridor is oozing with potential (some of which, hopefully, will be better articulated by the Broadway/Valdez District Specific Plan process that recently launched). It just can’t quite figure itself out. Anyway, while we weren’t blown away by our first visit, we’ll certainly be back to see where Café Noir takes this thing. (Plus, the value of good espresso in the neighborhood shouldn’t be underestimated!) If they can hang in there while Auto Row sorts itself out (and until Kaiser opens its new hospital a few blocks up the street), they may be onto a great thing. Update, 09/18/09: Café Noir now has a beer and wine license and is open for dinner Thursday through Sunday, so we headed there to check it out one recent Saturday night. We tried the special pizza of the day—roasted pasilla peppers, green onions, and four cheeses—along with a mixed greens salad; both were quite tasty. D. deemed the wood-oven pizza “not as good as Marzano, but better than Arizmendi,” though I’d argue that it’s not actually the same style of pizza as Arizmendi, so it’s hard to compare the two. Still, we got in and out with pint of beer each for under $30, which is not bad at all; we’ve never managed that at Marzano! Café Noir continues to have problems filling the space, which may stem in part from their fluctuating hours as they get licenses and such sorted out. While we were there, a few people poked their heads in and murmured things about how there wasn’t much happening—I presume they then headed next-door to Mua for music and cocktails. But I actually think that’s one of the best things about Café Noir: it’s not trying to be a place to be seen. While we were there, one group was celebrating a birthday, while another couple was having crepes and coffee in the upstairs lounge-like area. It’s definitely a place you could take kids, in contrast to a lot of the new Uptown spots. And it seems like it would be a perfect place to work on a rainy winter night, since they also have free wireless. So, yeah. They still need some more people to really get their groove on, but slowly things seem to be coming together.